Loving father of Craig (Gail) Backus and Jennifer (Tim) Farmer. Cherished grandfather of T.J. and Nate. Dear brother of Lynn (Susan) Backus and Sandra (Richard) Herron. Funeral Wednesday 11 a.m. (in state 10:30 a.m.) at First United Methodist Church of Farmington, 33112 Grand River Avenue, Farmington. Officiant Rev. Dr. Jeffrey R. Maxwell, Pastor. Visitation Tuesday 2-5 and 7-9 p.m. at Thayer-Rock Funeral Home, 33603 Grand River Avenue, downtown Farmington (1 blk. W. of Farmington Rd.). Interment Glen Eden Memorial Park, Livonia. 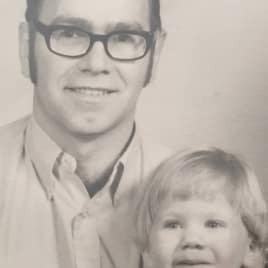 The picture is of my Dad and I (Craig) from when I was probably 2 years old (1971). My Dad could grow some very manly sideburns! Dear Craig...May your father live forever within your heart and mind. Healgrief has a memorial to share with you. https://healgrief.org/ronald-backus/ We invite you to express condolences, share special memories and photos and light virtual candles to honor and celebrate the life of our loved one. We also invite you to share this with others who may want to be notified as well. You may do so by sharing the link or by clicking the “Share this Memorial” button from within the memorial itself.